Wow, I wish somebody’d told me my second home was so much swankier than my first one before I moved in. I didn’t know I had the funds to install a wall-to-wall wine rack, or employ a stonemason, or arrange low-slung couches & leather armchairs in my lounge in such offhand fashion. I didn’t know I had such fine taste. Better yet, my good taste turns out not to be automatically synonymous with expensive taste. After 4 dishes & 4 drinks, the Director & I owed 40 bucks apiece. If I’d have known it would be so reasonable, I’d have eaten way more & wished I had two working mouths like that wacky Indian baby. 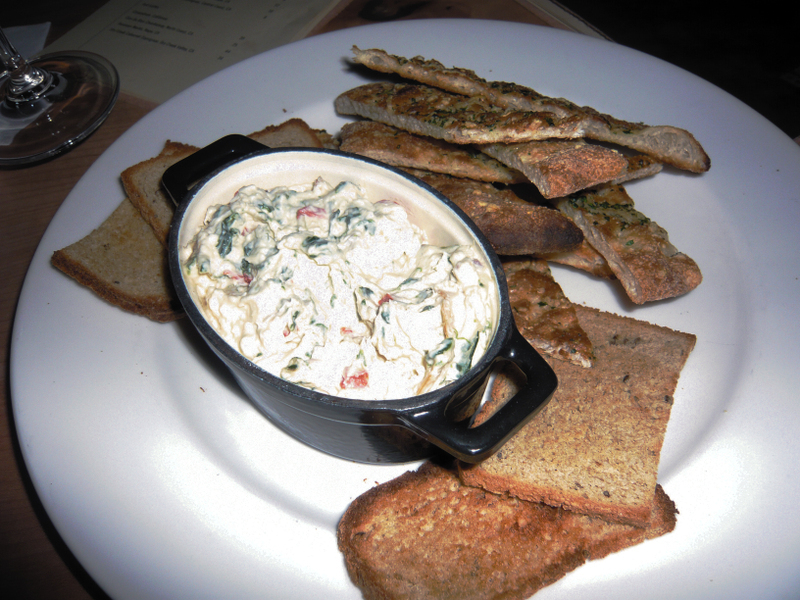 Served with herbed flatbread wedges & rye toasties, it was solid, chunky, more like a spread than a dip proper: think brick-type cream cheese suffused with the smoke of the flaked trout & tinged with the iron of torn spinach. Huh, brick, iron, smoke—sounds like we were eating a detail from an industrial landscape. In that case it tasted better than it sounds. 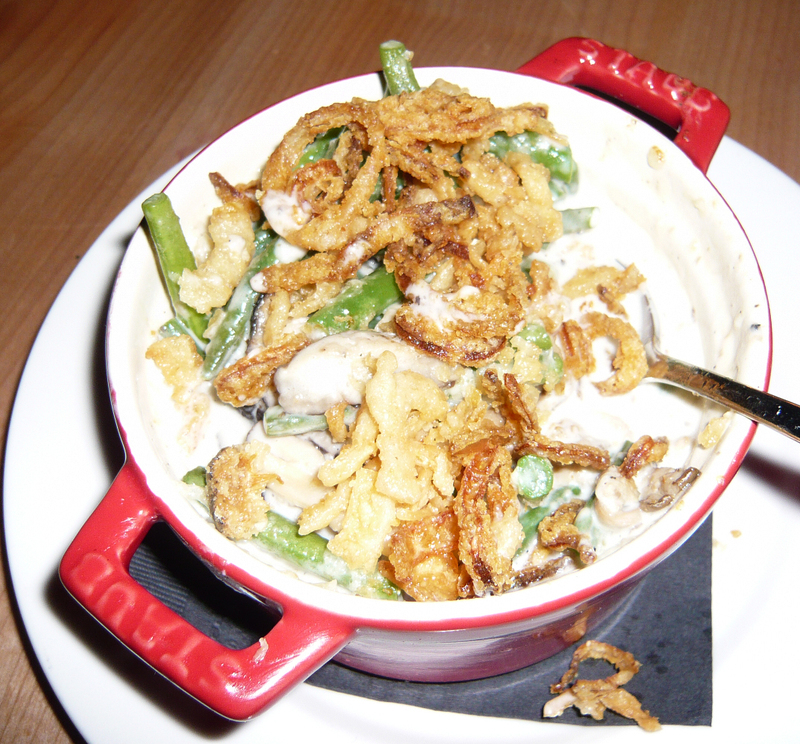 Or take our side of green-bean casserole. All too often, chefs’ ostensibly playful takes on white-trash cooking are just plain condescending, being no better but 10 times as expensive as the originals—you know, the whole “let’s serve tiny boudin noir with green-tomato chutney & call them ‘cocktail weiners with ketchup! '” or “let’s make our own English-rose-&-African-violet-infused jellybeans & then put them in little boxes which we’ll smear with sugar ‘thumbprints’ so it seems like they’ve been fished back out of the movie-theater garbage can by alley bums!” thing is so played out. But this, richly fresh with green beans & that funkiest of spoonable perfumes, cream of mushroom soup, is downright soulful. Sprinkled with fried shallot rings, it does its part to right a wrong that contemporary kitchens have been perpetuating for all too long. My hat’s off, & it’s not even a Prada trucker cap.